Our new product for our Daz store: EJ Narumi for Genesis 3 Female. Narumi, a gorgeous Asian beauty, is prepared for all the adventures and stories you can imagine. She has lots of customization options, casual makeups and lipsticks and special makeups of different themes: Kabuki, Modern Geisha, Anime, and Bloody Eyes. She also has claw nails, cute ear morphs, fantasy eyes in purple, pink and red, all black eyes, decorated nails, and Asian tattoos in arms, back and chest. A must have! See images and get her here: EJ Narumi for Genesis 3 Female. 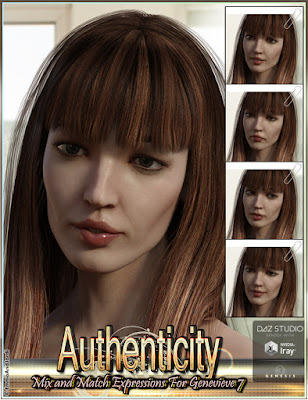 Our new product at DAZ: Authenticity Mix and Match Expressions for Genevieve 7 and Genesis 3 Females is a set of high quality expressions for Genevieve 7 and Genesis 3 Female(s). For each expression you have 4 ways to use it: one click presets for full face expressions, upper face partial expressions, lower face partial expressions, and pose control dials. Maximum customization possibilities! A must have! Our new product is a Daz original: Avelyn Hair for Genesis 3 Female, included in the Pro Bundle of Genevieve 7, although it can also be purchased independently and works for Genesis 3 Female and figures based on her.